Free continental breakfast cushy beds free Wi-Fi an outdoor pool and free parking draw praise from our guests at La Quinta Inn & Suites Orlando South. The three-story hotel has 125 value-priced rooms all with premium cable TV free local calls complimentary weekday newspapers desks with ergonomic chairs coffee/tea makers and free Wi-Fi. Beds with pillowtop mattresses and cotton-rich sheets promise a good night's sleep and the hotel's free continental breakfast with waffles bagels pastries toast fruit hot and cold cereals milk and all-you-can-drink coffee and juice gets guests ready for their theme park adventures. A refreshing dunk in the outdoor pool should also be on the agenda. The hotel provides laundry facilities and free parking. 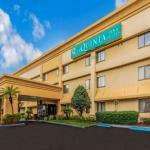 Centrally located right off Florida's Turnpike east of Highway 528 which heads west seven miles to I-4 and the theme park corridor la Quinta Inn & Suites is a 15-minute drive from Orlando International Airport. SeaWorld is five miles southwest Universal and Wet 'n Wild are about eight miles northwest and the magic of the Magic Kingdom at Walt Disney World is 16 miles southwest of the hotel. Downtown Orlando is seven miles north and the Florida Mall is one mile north.